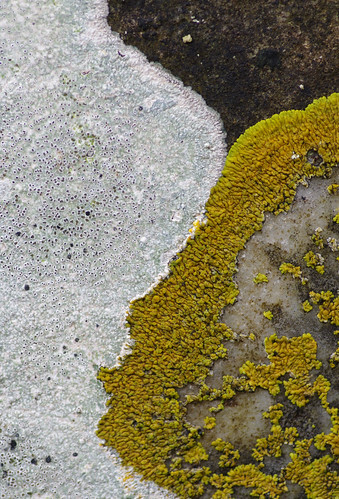 Left to their own devices, some lichen species can survive almost anywhere. There are the early colonisers of new or altered habitats, as well as those returning to places where they once thrived. Sulphur dioxide levels in many British cities have fallen but not all clean air indicator species have enjoyed an immediate recovery. 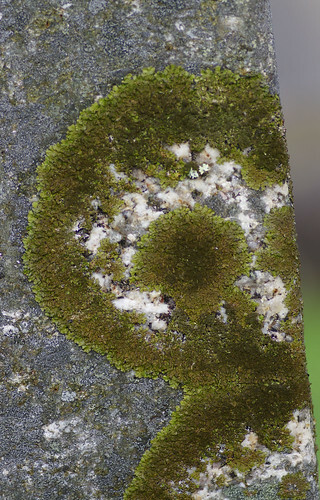 A wide range of species have been recorded in churchyards and cemeteries precisely because they can remain mostly unchanged for centuries. Apart from the new graves (nowhere is completely immune to the march of time) and the parish council notices concerning headstones that have been tilted back for health and safety reasons to prevent them falling on people) everything is mostly as it was. The oldest headstones had a diverse range of species. Unfortunately, many of them seemed to be inseparable. 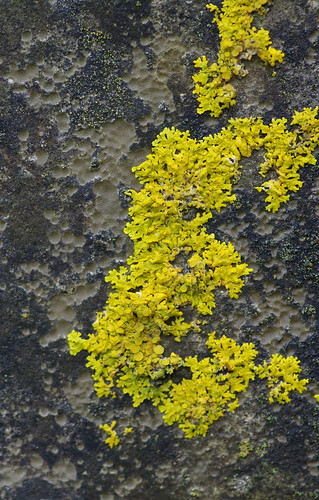 After weeks and months of much higher than average rainfall, many specimens looked markedly different, the yellow ones taking on a distinctly greenish tinge. The lobes here resemble slightly flattened bits of sweetcorn. This decision was reached by process of elimination. I had hoped the Cladonias (meaning cup-shaped) would be easy to distinguish. 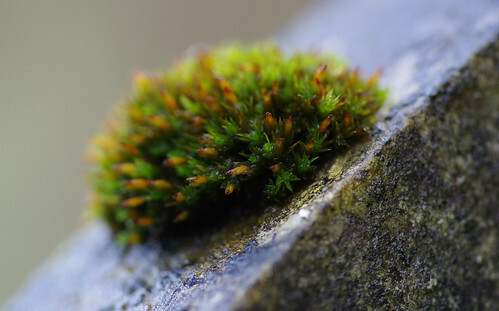 These were growing on moss on top of a tombstone. 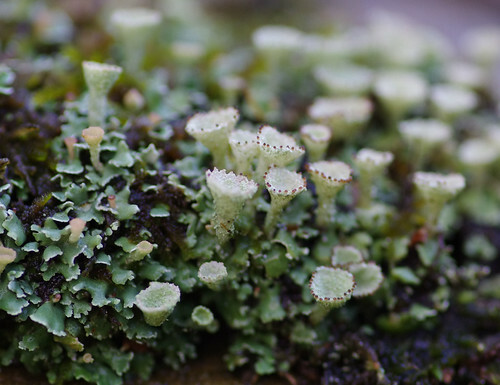 The leafy bits to the left and underneath the cups belong to the same species and are known as squammules. 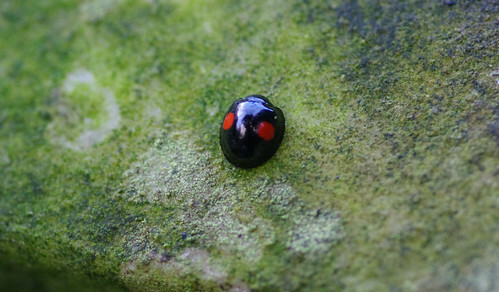 We did not expect to see a ladybird in the darkest depths of December. The skirted fringe of the body and the red spots confirmed the identification. Anomalous Bristle-moss is remarkably similar but the capsules are on stalks above the leaves. Here they are nestled among the leaves. 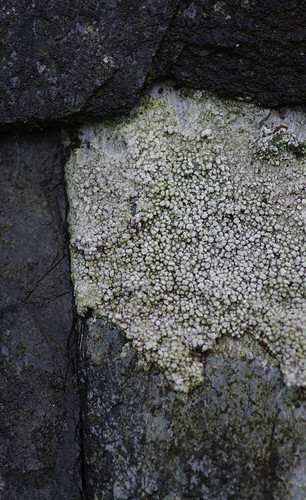 Although the above bears a close resemblance to Lecanora helicopsis I have ruled that species out (for the time being). According to my guide, Lecanora helicopsis is common on coastal rocks. Would it be found on a gravestone two miles inland? I suppose it is feasible if you apply a liberal interpretation. Exposed coastal sites might have provided a local and relatively accessible means of procuring rock and transporting it inland. As usual there were more questions raised than definitve answers. The brown discs were convex and button-like, and were as neatly shaped as jewels. 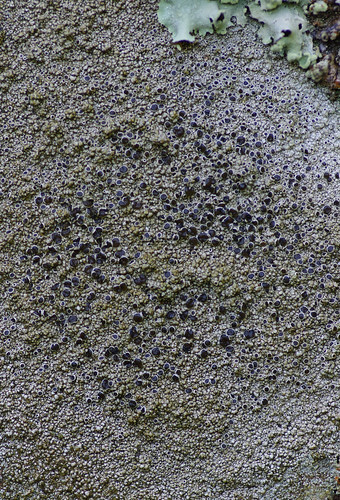 And the group of small brown circles in the bottom right corner belong to a different species altogether. 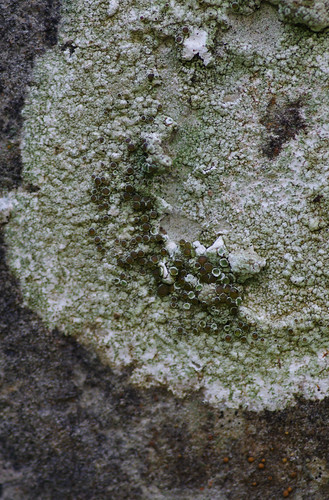 I think the white species on the left could be one of the Verrucaria species (possibly Verrucaria hochstetteri). 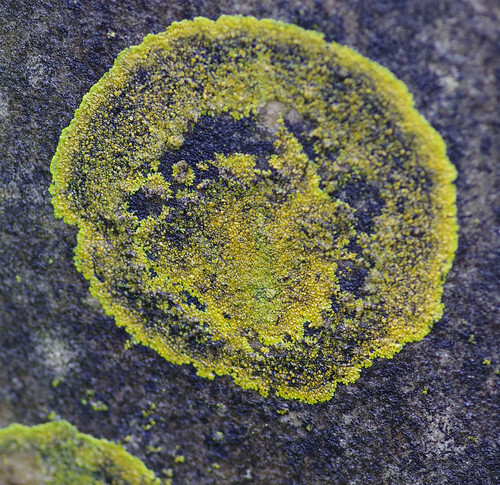 A yellow Caloplaca species lies to the right. The above texture put me in mind of foamy surf clashing with sandy shore. It made me wonder if these two are engaged in an epic territorial battle. This is undoubtably the same species as featured in the last picture. Springy Turf Moss is common in U.K churchyards, has red stems and is described as resembling an eight-pointed star when viewed from above. But its leaves are bent back, while those found above point slightly forward. Due to its relatively large size I think this is probably Big Shaggy-moss (Rhytidiadelphus triquestris). 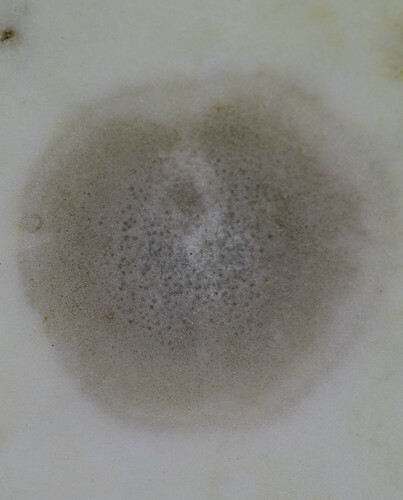 I reckon the black and white rings (neater than those of Tephromela atra) belong to Lecanora gangaleoides. 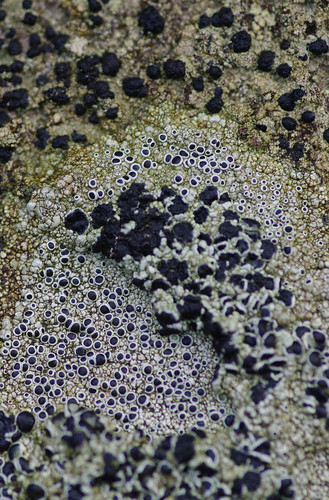 The other black crustose species is, as yet, unknown. 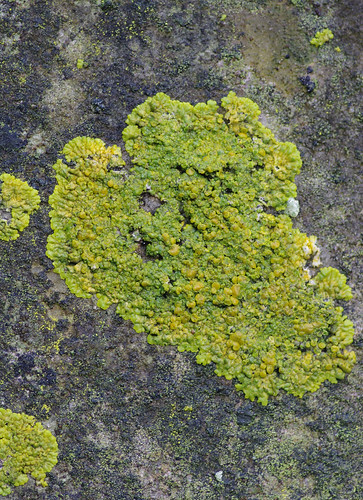 As well as proliferating across the surface of rocks, lichens can appear immersed in the surface. Sometimes they expand across borders, while at others they confine their growth to one specific area. 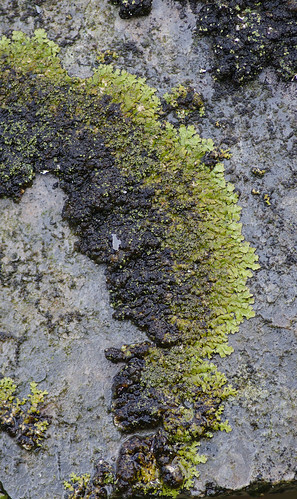 At first glance you could be mistaken for thinking this is a moss, partially washed away by heavy rain. 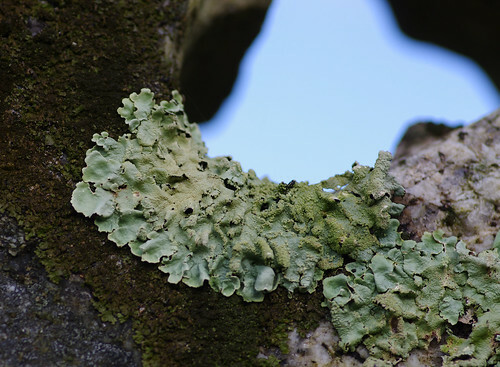 But then the lobed edges scream 'LICHEN!' at you and the only task left is to pick one winner from amongst a thousand contestants. We moved between the stones, examining the back and front. This was on the back of one tombstone and made an arresting sight. 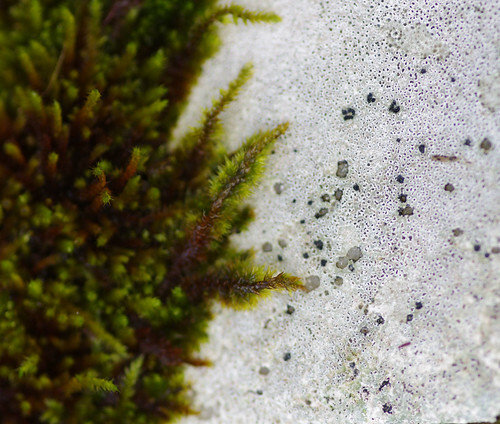 This is the same mossy type as earlier. 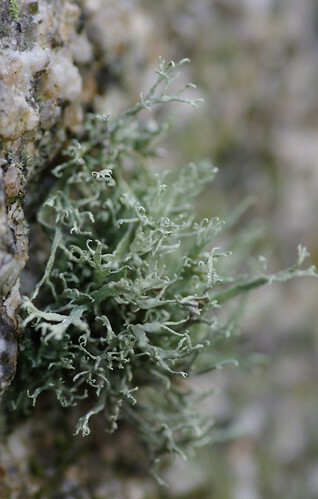 What's interesting here is how the lichen seems to thrive on limestone but is mostly absent from the quartz areas. This was found growing in the hole of a Celtic cross. By now we were feeling a bit overwhelmed by the sheer diversity of species on offer. Seeing a bench ahead, I decided I needed to give my brain a well-earned rest. There was a slight glitch, however. 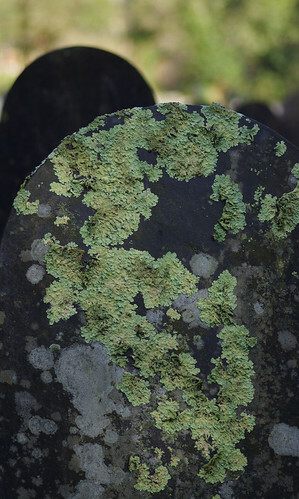 There were just as many lichens growing on the surface and out of wood as we had seen on the tombstones. Recently, I have been seeing a lot of these curious, wiry miniature trees in unusual places. There is even a tiny one growing from the diagonal roof of our bird table at home. These were growing together on a single panel of the wooden bench. It did not feel right to take the weight off my feet and I certainly could not take a mental break just yet. I deliberately cropped this shot thin and wide to isolate one of the three horizontal panels. These textures would not look out of place in an art gallery. 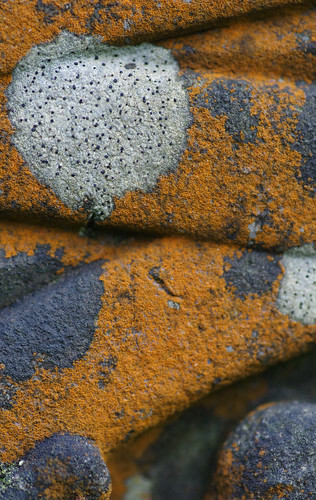 We could probably have stayed for longer but decided to call it a day on the lichen front. There was more than enough to ponder and poor Lady was beginning to feel a bit left out. So we left the cemetery behind and headed across the road to a path leading up through a strip of woodland. 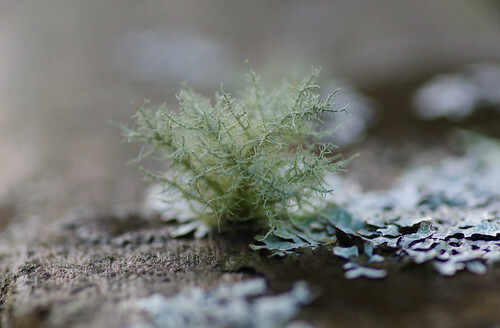 I think as far as lichens are concerned I might be trying to run before I have learned to crawl. I bought Frank Dobson's excellent illustrated field guide on the subject and am still struggling to get to grips with it. There are just too many species to choose from and lots of technical terms to learn. Thankfully the author (in partnership with the Field Studies Council) has produced a series of laminated 'beginner' guides highlighting the most common species in different habitats. I will be buying these soon and anticipate much better results.